It’s a Wrap! It’s a Pocket! It’s a Sandwich! My first experience with pita bread was in 1973, when I lived in Israel. I ordered a grilled cheese sandwich and it came in this round, flat bread with a pocket, which I later learned was called pita bread. After that I ate felafel with tahini sauce and veggies and fell in love with the idea of this kind of sandwich. Sandwiches on sliced bread are as American as apple pie. And most bag lunches feature some kind of sandwich. 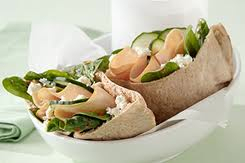 In the last few years, however, others forms of “sandwiches” have become popular, such as the above-mentioned pita pockets.Â NowÂ we have all kinds of sandwiches that do not use the traditional two pieces of bread. 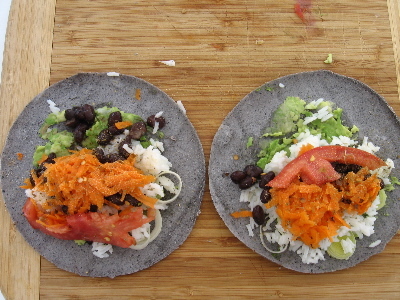 Bagels are no longer used only for lox and cream cheese, tortillas no longer need to be stuffed with only rice and beans, and Nori wraps can roll around all kinds of veggies and grains. With school starting, I thought I would offer some ideas for traditional and non-traditional sandwiches. Here are some ideas for making sandwiches, using whatever kind of wrap or bread you like.Â Many of these ideas come from the Nutrition Action Healthletter, January/February 2011 and others from my own cookbook, The Whole Foods Experience. (Go to MY BOOKS for ordering info). 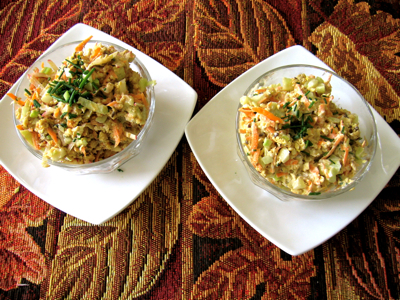 Dressing can be as simple as olive oil & lemon with a touch of mustard or use a natural dressing that you purchase. Add salt, pepper, cayenne pepper or other condiment of your choice. Also, for those on gluten-free diets, use your favorite gluten free bread.Â Add a bowl of soup and a hearty, tasty, healthful lunch is ready to eat! Grilled tofu flavored with mustard, ginger & tamari soy sauce; bean sprouts and sliced red or yellow bell peppers. P.S. Feel free to create your own sandwiches combos. If you create one you really love, please send it for me to post. This entry was posted on Thursday, September 8th, 2011 at 8:36 am	and is filed under Kitchen Nutrition. You can follow any responses to this entry through the RSS 2.0 feed. You can skip to the end and leave a response. Pinging is currently not allowed. 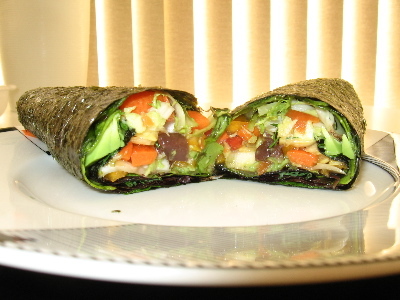 I LOVE the idea of making a non traditional nori wrap! I will definitely use that idea for my next “sandwich”. It’s GENIUS!